Arthropod-borne viruses (arboviruses) generally require horizontal transmission by arthropod vectors among vertebrate hosts for their natural maintenance. 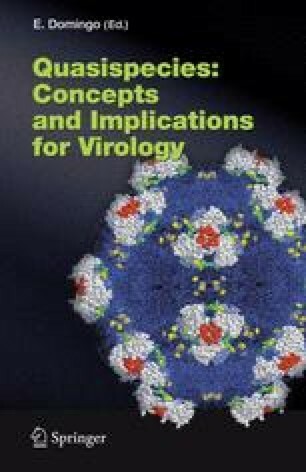 This requirement for alternate replication in disparate hosts places unusual evolutionary constraints on these viruses, which have probably limited the evolution of arboviruses to only a few families of RNA viruses (Togaviridae, Flaviviridae, Bunyaviridae, Rhabdoviridae, Reoviridae, and Orthomyxoviridae) and a single DNA virus. Phylogenetic studies have suggested the dominance of purifying selection in the evolution of arboviruses, consistent with constraints imposed by differing replication environments and requirements in arthropod and vertebrate hosts. Molecular genetic studies of alphaviruses and flaviviruses have also identified several mutations that effect differentially the replication in vertebrate and mosquito cells, consistent with the view that arboviruses must adopt compromise fitness characteristics for each host. More recently, evidence of positive selection has also been obtained from these studies. However, experimental model systems employing arthropod and vertebrate cell cultures have yielded conflicting conclusions on the effect of alternating host infections, with host specialization inconsistently resulting in fitness gains or losses in the bypassed host cells. Further studies using in vivo systems to study experimental arbovirus evolution are critical to understanding and predicting disease emergence, which often results from virus adaptation to new vectors or amplification hosts. Reverse genetic technologies that are now available for most arbovirus groups should be exploited to test assumptions and hypotheses derived from retrospective phylogenetic approaches.